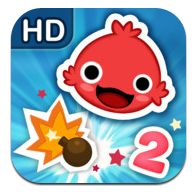 iBlast Moki 2 HD (v1.1.1) — Mobers.ORG — Your Daily Source For Mobile FUN! The awards winning puzzle game iBlast Moki is back with an all new adventure in a colorful world of paint and bombs. In this new adventure, the Mokis will use the help of new gameplay elements such as the paint bombs and more crazy contraptions to reach the magic spiral.